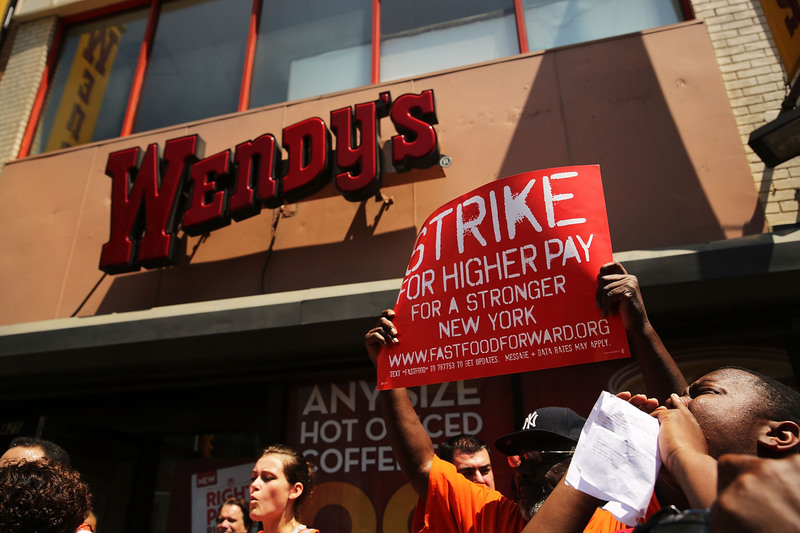 Fast food restaurants are offering their value meals with a side of labor strife this week, as workers in seven cities gather momentum for their largest, most organized round of strikes yet. "No more burgers. No more fries. Make our wages super-sized," protestors are chanting. Many of us make minimum wage — just $7.25 an hour, or as little as $11,000 a year. Meanwhile, the Goliath corporations we work for, like McDonalds, Wendy’s, Taco Bell, KFC, and Pizza Hut, are part of a $200 billion industry. These corporations reap huge profits and shower CEOs with exorbitant compensation while most of their employees qualify for food stamps. The Chicago Tribune says this round of strikes has been organized by groups such as New York Communities for Change, Jobs with Justice and Action Now, while The Service Employees International Union has provided them with funding. As with any minimum wage discussion, the question of "Who's actually earning this salary?" has emerged front and center. Strikers have focused their language on the outsized cost of living, to emphasize that workers cannot support families on a stagnant minimum wage. With more and more Americans in low-paying work for the long-term, they argue, this becomes a question of social welfare, and not (ahem) "How much money should my teenager earn at her part time job?" Employers argue that raising wages would necessarily cut the numbers of jobs available, as employees became a greater expense to the business. NPR reports some fast food restaurants consider low-level workers too expensive already: Some have started considering means of automating the work they do, with iPads and other electronics.